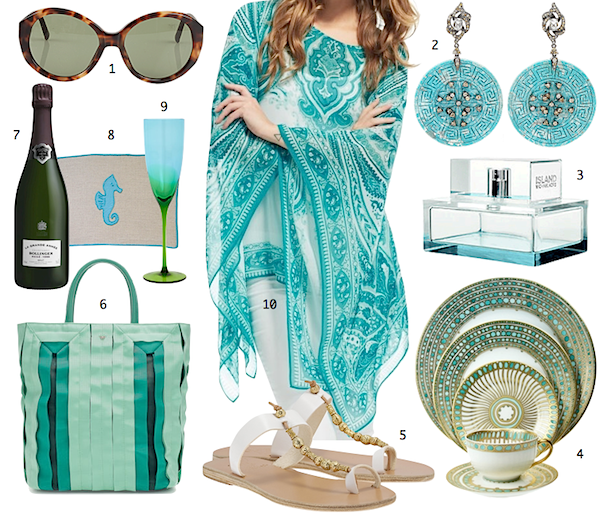 Whether an afternoon or a week, on a sailboat or a motor yacht, summer is the time to channel your inner sea goddess in style. Call out shades of aqua and soft greens to echo the cool colors of the waters. You’ll feel refreshed and ready to elegantly entertain or be a casually chic guest at sea. This entry posted in At Ease, entertainment, fashion, food and drink, gifts. Entry Tags: fashion, Jewelry, Yachting style Bookmark the permalink. Stacey adore your choices. I love all of the cool colors of summer; they remind me of the sea…and so many great memories! I’m ready to go lounge beside some turquoise sea. Such beautiful colors here. I think I might be a little obsessed with those sandals! Happy weekend, Stacy! We’re feeling cooler already! It’s a shame we can’t show up to our regattas wearing something so fabulous as that Calypso poncho. Hope you have a wonderful weekend and we’re so glad to be back and blogging. 78 queries in 0.395 seconds.